Sometimes it may be different for a newbie in marketing to distinguish single opt-in from double opt-in. So, what are the differences between this definitions? People get to your email list after filling the registration form. It’s much better than opt-out method, cause it excludes automated subscription, but there is one problem with this one too – somebody can use your email and subscribe you to a newsletter you don’t even know about – f.e. your husband, sister, clever talking parrot, etc. So, people may become frustrated after receiving letters they didn’t give their permission on, and send complaints on you with wishing to add you to spam filters. When somebody wants to get subscribed to your newsletter, you’re sending him confirmation email. This person should click on received link to confirm their will to be involved in this business. Using this way of subscription, people won’ blame you in spamming and one more important nuance is that only interested auditory will receive your letter, and response rate will be much higher, what will positively affect your business. Pros Main benefit of single opt-in is that when a subscriber signs up, they’re immediately on the list. That allows you to grow your list fast, and connect with new subscribers more quickly. Using double opt-in is that you have a more engaged list. Because subscribers have to confirm, you know that the people on your list really wanted to sign up. That should make them more responsive to your emails, and more likely to open and click. There are no extra actions or clicks. They are subscribed instantly without needing to confirm. Asking for an email confirmation helps ensure you get a real address. Using double opt-in is also a great way to keep your email list clean. You get quick results, while they get the instant gratification of immediate addition to your list. Plus you don’t need to worry about unconfirmed subscribers lingering in limbo; everyone who signs up is on the list. Since all list members are confirmed, using double opt-in gives you more accurate subscriber data. And that means you don’t have to worry about spending money on emailing people who aren’t interested, and may not even be real. Cons There’s a much higher risk of being reported for spam. If people change their mind about signing up, they may identify your email as spam rather than simply unsubscribe. 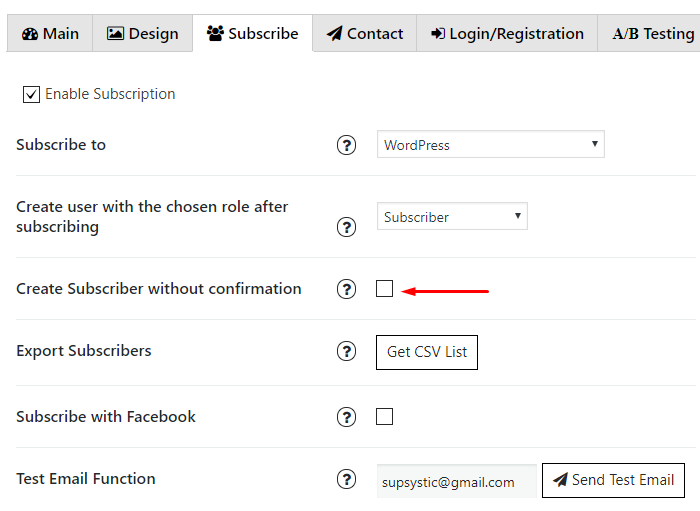 Double opt-in creates a longer signup process for subscribers. The more steps there are, the more likely it is that some people won’t complete them. With single opt-in, mistyped email addresses can end up on your list. Compare that with double opt-in, where those emails wouldn’t be able to confirm. Big disadvantage of double opt-in is slower list growth. As you’ll soon see, email lists grow much faster with single opt-in. There may be legal compliance issues with single opt-in in some territories. Some subscribers will forget to click the confirmation link, which means they’ll never actually become subscribers. Once you’ve decided which of the two options is right for you, you’ll need to configure, which kind of subscription you’d like to use. Check this box, if you want to use double opt-in, or deselect it to choose single opt-in. There is no right or wrong answer. Look at your audience and go with your first instinct. You can always switch it later so don’t be afraid to try both and compare results.